Long a weekend ski trip destination for visitors from the Tri-State area as well as the rest of New England, Killington has a fabled après-ski scene and extensive dining and nightlife options unrivaled in the East with the possible exception of Stowe, which is 90 minutes farther north. Located in southwestern Vermont, The Beast is conveniently located near the intersection of I-91 and I-89 and is about 4-1/2 hours from New York City and under 3 hours' drive time from Boston. That’s close enough for a long day trip, but Killington is so big, bold and interesting that you’ll really want to stay for at least one night if you can, and there’s certainly enough to do nearby to occupy family and friends for a week if you’ve got the time—you can literally ski a different peak each day. All total, Killington has 1,509 skiable acres (on- and off-piste) and 73 miles of trails, while Pico has another 468 acres of skiable terrain and close to 20 more miles of trails. Skiers can use their Killington lift tickets at Pico, but the two mountains are not connected by trails. Terrain is varied, and with so many trails, the Beast offers plenty of green cruisers like Great Eastern (from the summit of Skye Peak via the Superstar lift) and Great Northwestern, bunny slopes for beginners at Snowshed, solid blues on Ram’s Head (including the open glades on Squeeze Play, a great place to get introduced to tree skiing), as well as some serious challenges for advanced skiers, like the notoriously steep and bumpy Outer Limits on Bear Mountain and the glades and multiple black-diamond runs in The Canyon. Snowboarders (and adventurous skiers) also have six terrain parks full of more than 150 jumps, rails, halfpipes and natural features to play on. Lift ticket prices are as supersized as The Beast itself: Undiscounted full-day adult passes are $119 per non-peak day ($92 for kids ages 7 to 18) as of 2019, although you can save by buying online in advance.Visit Killington on peak holiday dates, and the prices climb to $124 for adults, $95 for kids. Season passes start at $1,219 for adults over age 30, with discounts for seniors, skiers ages 19-29, youths ages 7-18, kids 6 and under and the eternally youthful over-80 set. Tickets are good at both Killington and Pico Mountains. You can save substantially by purchasing season tickets in the summer or fall before the upcoming winter season. The Ledgewood Yurt, open for ski-in lunches as well as romantic five-course dinners, with guests arriving in sleighs. The legendary steaks and après-ski scene at the Wobbly Barn. Other local hot spots include the Pickle Barrel Nightclub, Mogul’s Sports Pub, Choices and The Foundry for sit-down dinners, and Domenic’s for thin-crust, hand-tossed pizza and chubby calzones. Ski and snowboard equipment package rentals are available on the mountain at the Snowshed Lodge, Bear Mountain Lodge, Ramshead Lodge and K-1 Lodge. Adult rentals are $58 per day, $42 for skiers ages 18 and under (add $5 for upgraded “performance” equipment). Helmet rentals only are $16 daily. You can also rent from the mountain-affiliated Killington Sports Store, located on the corner of Killington Road and Route 4, or local outfitters Black Dog Sports, Peak Performance Ski Shop or Basin Sports. The Killington Snow Sports School offers alpine and nordic skiing and snowboarding instruction for children and adults. Private lessons start at $150 an hour and can be tailored to specific needs like mastering your freestyle, mogul and racing skills or learning to ski glades safely. Group classes are arranged by ability level and cost $79 per two-hour session for adults. Half- and full-day lessons are available for kids. Killington also offers ski camps for women, mogul skiers, telemark skiers, adventure skiers and racers. Visiting Vermont with non-skiers? Killington offers much more for them to do than drink beer in the lodge or tend the fireplace in the condo. The Killington K-1 gondola isn’t just for skiers: You can also ride the enclosed cars to the 4,241-foot summit for a meal with a view at the Peak Lodge. Gondola rides are a popular summer and fall leaf-peeping activity, too. Killington’s Beast Mountain Coaster operates year-round, swooshing riders 4,800 feet downhill in a series of turns, corkscrews and straightaways. Tours are offered by snowcat, snowmobile and snowshoe. The Killington Tubing Park has multiple lanes and lift service, so you can get the maximum number of fun runs during your 60-minute tubing session. Killington’s extensive snowmaking operation is a primary reason the mountain can stay open from late October through June 1 even in the face of New England’s wildly unpredictable winter weather. But the action hardly pauses when the snow inevitably melts. 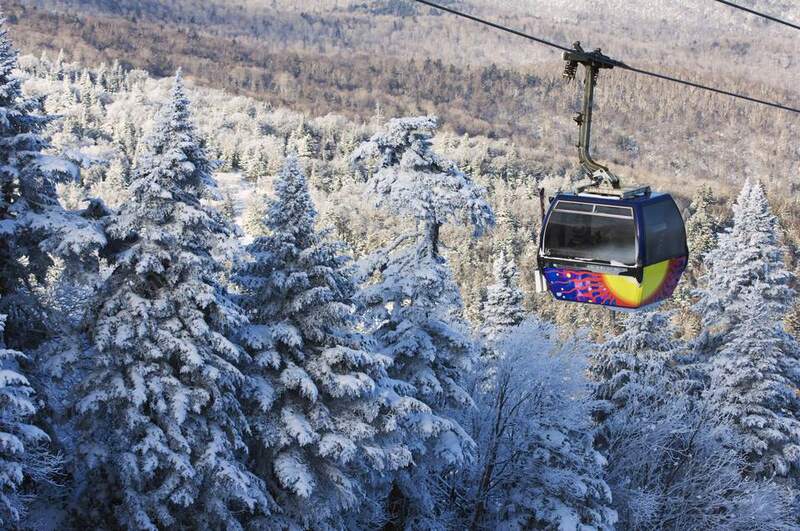 In addition to the Beast Coaster, warm-weather activities at Killington include golf, a mountain bike park with 29 trails and more than 30 miles of (mostly) downhill lift-serviced riding and more than a dozen activities at the Snowshed Adventure Center including a zipline, ropes course, jump tower, trampoline jump and a challenging 5,000-square-foot maze. Segway and ATV tours and kayak and paddle board rentals are popular options, too. A day on the slopes or in the adventure park will wear you out, which is just one of many reasons you should consider staying overnight at Killington rather than packing up the car for home. The resort has a wide variety of lodging options, from the posh Killington Grand Resort Hotel and the rustic Killington Mountain Lodge to inns and condos. The advantages of staying at the Grand Hotel include ski-bridge access to the slopes in winter, a short walk to the adventure park and golf course in summer and full-service resort amenities that include a luxury spa, fitness center and an outdoor heated pool and two hot tubs—perfect for soothing your weary ski muscles as the snowflakes tumble out of the sky. There also are numerous hotels, motels, B&Bs, AirBnBs and vacation rentals in the immediate vicinity, including mainstays like the Mountain Green Resort, the Mountain Sports Inn and The Mountain Inn; all can be booked online or via Killington Central Reservations at 800-621-6867.